They’ll say You Shouldn’t Have, but they’ll be so glad you did! 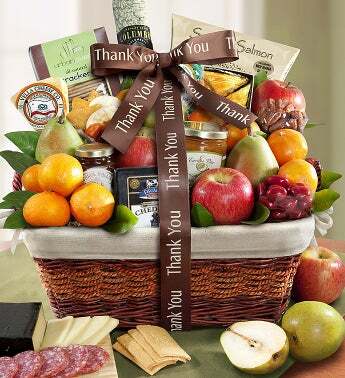 Send this gorgeous gift basket that’s filled with elegant and inspired from the foothills of California. They’ll love the Succulent D'Anjou Pears, Crisp Fuji Apples, Fresh Satsuma Mandarin Oranges, Fiscalini® Farmstead Cheddar, Vella Mezzo Secco Dry Jack Cheese, Olive Oil Crackers, Bakery-fresh Baklava, Earth & Vine® Provisions Apple Cranberry Pear Chutney, Columbus® Dry Salame and much more. And it all arrives, lovingly handpicked and hand-packed, in this hand-woven fabric-lined willow and rope gift basket. It’s easy to share – if they dare! They’ll say You Shouldn’t Have, but they’ll be so glad you did! Send this gorgeous gift basket that’s filled with elegant and inspired from the foothills of California. They’ll love the Succulent D'Anjou Pears, Crisp Fuji Apples, Fresh Satsuma Mandarin Oranges, Fiscalini® Farmstead Cheddar,Vella Mezzo Secco Dry Jack Cheese, Olive Oil Crackers, Bakery-fresh Baklava, Earth & Vine® Provisions Apple Cranberry Pear Chutney, Columbus® Dry Salame and much more. And it all arrives, lovingly handpicked and hand-packed, in this hand-woven lined willow and rope gift basket. It’s easy to share – if they dare!